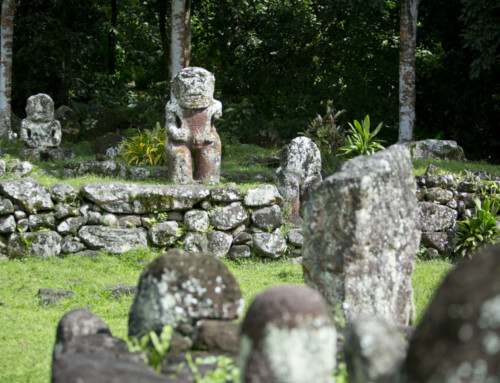 Long ago, a happy couple lived on the island of Maiao, formerly called TupuaiManu. One day the woman got pregnant and gave birth to an egg. Her husband took it and put it in a cave. When it hatched, a yellow lizard came out. The couple called it Moorea and raised it until it got big. It became immense and its parents were afraid and decided to give it up and abandoned it on a canoe in the East of Tahiti. Moorea waited for his parents and did not stop thinking about them and about all the affection they had given him. However, seeing that they weren’t coming back, he said to himself that he had been abandoned. He then plunged into the sea and swam towards the sun. He couldn’t see land anymore and Moorea fought against three currents: Teara-Veri which path was similar to that of a centipede, Tefara which was as thorny as a Pandanus, and Tepua which was as foamy as soap. Moorea died in the third current. His body floated and ended up on the shores of Aimeho (the former name of the island of Moorea). At dawn, two fishermen found the lifeless body of the yellow lizard. They then ran to inform the islanders of their lucky find and shouted: “A yellow lizard! A yellow lizard! ”…. And that is how Aimeho got the name of Moorea.